Node Linking Device is a block added by the Thaumic Bases 1 mod. It allows the player to link Aura Nodes by draining one and growing the other. For more information visit Node Linking page. From one source to another! "Nodes. The things that link your world to the world of magic. 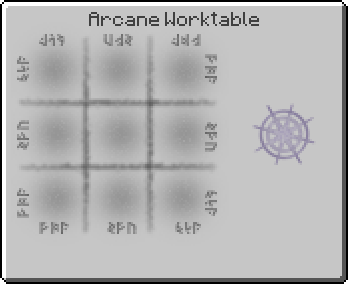 They are heavily used in thaumaturgy - some devices use them to function, you need them to recharge your wands. However there is a small problem - a node can always store that much of vis and if it has, for example, no terra it it - this is it, it has no terra, and that aspect can't be gained from the node. There sure is a so called 'node bullying' - one node eating other, smaller nodes. With the discovery of the Advanced node stabilizer that can be worked with, but it takes a ridiculous amount of time and also is unreliable. You have discovered a device that might get the job done. The node Linking Device creates a mysterious link between 2 nodes and will move aspects from the linked one to the linker. You need 2 of this devices placed on top of nodes. Then just take your wand and right click on the reciever. After that click on the transmitter - and the link will be estabilished. The link will firstly drain all aspects out of the transmitting node's pull, then it will draw the node's capacity and will increase the reciever's capacity based on that. Lastly the node without any capacity left will fade away. The chance of the reciever node to increase it's aspect capacity is around 70% for each capacity decrease on the transmitting node. The transmission however is pretty unstable - both nodes will react to the link. This will result in a so called instability. The more time the device functions - the more instability it will have. Based on the amount of instability different things may happen - from the aspects escaping out of nodes on both ends into air in form of flux, to the complete transmitting node destruction with the explosion. The recieving node however will never get harmed in any way." Node Linking Device has no known uses in crafting. This page was last modified on 20 June 2016, at 18:16.